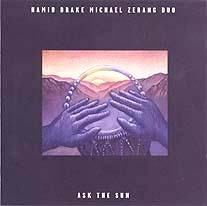 Hamid Drake; tabla, drum set, djimbe, conga, frame drums, bells, gongs, shakers, cymbals, tambourine, didjeridoo, voice; Michael Zerang, dumbek, frame drums, tambourine, drum set, trap set, dawoola, bells, gongs, cymbals, chimes, bass drums, didjeridoo; Ashik Altany, zurma (track 5); Eddie Zerang, djimbe (track 5). Recorded 14 and 15 September 1995 at Airwave Studios, Chicago; track 6 recorded on 19 May 1991 live at Club Lower Links, Chicago. Cover (reproduced above) artist Eric Evans; graphic design by Louise Molnar.